At last the Annual Meeting is over and the meeting today (program planning for Officer’s training day)—two days later. When we started planning the meeting last fall, we thought if we could get 400 to attend we would feel like it was a success, since it was to be a different type of meeting. 748 were seated at the dinner at 6 o’clock in the evening. The Seminars were all filled—12 altogether. In the afternoon session which was held in the south ball room, 700 chairs had been set up and those were nearly all filled and many people were standing. The first session lasted from 2 until 3. Seminars from 3:15 until 5:15. A group came in following the dinner to hear the speaker—Miss Peggy Billings from the Board of Missions, so we can’t say just how many did attend. At any rate it is over and I think everyone is glad it is over and was what we consider a success. There were 96 tables set up for the dinner. With the help of three other persons, we made 97 table decorations. Centerpieces made with a 15” candle in the center, surrounded with evergreens, straw flowers and paper butterflies. Everyone seemed to think the centerpieces were very attractive. We gave them away after the dinner. No problem there. I didn’t want to have to gather them up after the meeting, so decided to let someone from each table have one. My typewriter still hasn’t been repaired. I hope to get it in to the shop next week before I leave for a good overhauling. Probably should not be using it now, but hate to write by hand. Dad is doing some glueing for someone at the Health Center—now called Student Hospital. Somehow the word got around that he is good at repairing broken things and every once in a while, someone brings him something to mend. Glad the Avon soap has given Debbie so much fun. We had an Easter Egg Hunt after Mark and Shirley had the children came last Sunday. I have been wearing pant suits and had one on when they came. Becky said she would like to have one, so Grandma got one for her yesterday and mailed it to her. She is rather slender so it is hard to get a good fit. I didn’t take the boys measurements, so couldn’t get them anything. Hope they won’t feel slighted. Thought I might find something for them in Witchita. Your Insurance notice came and I am forwarding it. Lea & Bob didn’t come—both bad colds—so don’t know any more about Lea’s plans than before. 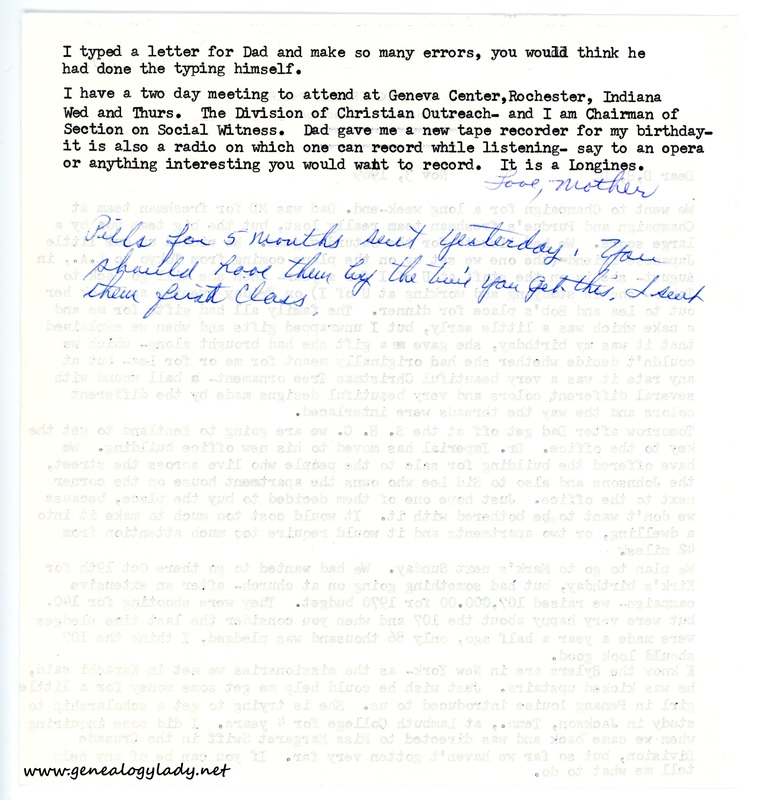 This entry was posted in Genealogy, Yegerlehner and tagged 1971, David A. Yegerlehner, genealogy, Gladys R. (Foster) Yegerlehner, Indiana, Lena "Lea" (Keith) Gieselman, Mark A. Yegerlehner, Methodist Church, Rebecca C. Yegerlehner, Robert Gieselman, Roscoe S. Yegerlehner, Shirley (Ward) Yegerlehner, West Lafayette on January 8, 2018 by Deborah Sweeney. Will try to get this written before a committee comes to help me with table decorations for our annual W.S.C.S. meeting which is being held at Purdue. Some thought if we got 400 registered, we would be doing well, but as of now there are 700 reservations for the dinner at 6 PM. There will be seminars in the afternoon dealing with issues of today such as Racism, Extremism, Population Explosion and Hunger, Pollution, World Development and Understanding, Sexuality and others to make twelve. Trinity women are making table decorations. I went to a floral shop—the woman who runs it belongs to our church and she showed me how to build this “thing” we are making. Just think in terms of getting made and delivered to the North Ball Room before Wednesday afternoon— and our meeting is in the afternoon and evening—90 separate table decorations. I undertook to do the job myself and thought I was about finished—had made 40 pieces, when I got word yesterday that we can expect 700 or more at the dinner. I had solicited help Wednesday and two women said they would come and help and it is about time for them to come. Dad is going to Kentland today to get some dental work done and if I can possibly get away for two hours, will go see Mrs. Myers. Have been too busy attending committee meetings, etc., etc., since my last letter to get up there. I have two gifts for her—Avon soap and Avon scented candles. She likes Avon soap so well, and I thought I could not give her anything better. Dad is having a vacation this week, since this is Easter vacation for Purdue students.—We went to Kentland yesterday and when we returned, my committee returned (they had worked with me for 2 hours in the morning) and we finished the decorations—90 altogether. Dad fixed a place in the basement to store the “pieces of art” until they can be taken to the North Ball Room, which may be Tuesday evening or may be Wednesday morning. When we had finished, Dad had us stand (my committee) with the decorations and he took a picture. Before we finished the decorations, John came home, but he didn’t disturb us, because we were too anxious to get our job finished. I don’t know what I will do if I get word of any more reservations—just make a few more center pieces I suppose. Lea and Bob didn’t come. John said they were both suffering from colds. Mark and Shirley and the children will come tomorrow. I colored eggs last night and some this morning. I have six baskets ready to put out for a hunt after they come. We have had a very warm, sunny day and tomorrow promises to be the same, so we can have the egg hunt out of doors. Yesterday when I visited Mrs. M. found her feeling as usual. She had gone to beauty parlour the day before and had a new permanent. Doris had taken her to the shop. Doris goes over about every two weeks and takes care of some of her errands. Yesterday (I mean Thurs.) was the first time she had been to the beauty parlour for a long time. The operator has been going to her apartment and giving her shampoos and sets. She does manage to go to the foot doctor in Watseka once a month or perhaps every six weeks, but other than that she has not tried to go out for a long time—except the day we took her to the McClures for lunch the day Dad gave a program on drugs for the high school class. I am having trouble with this typewriter and want to get it in to have it worked on when I go to Wichita April 22nd to the 26th. I think I had better stop writing, since it is so difficult to use this. Hope Debbie received her Easter package. The little Avon cologne is for Bonnie. 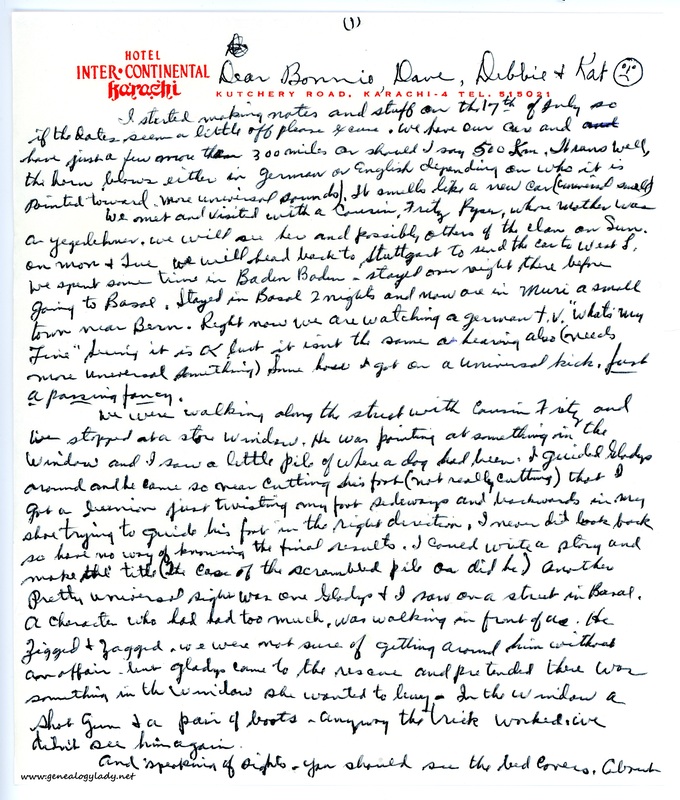 This entry was posted in Genealogy, Yegerlehner and tagged 1971, David A. Yegerlehner, Deborah Yegerlehner, Easter, genealogy, Gladys R. (Foster) Yegerlehner, Indiana, John F. Yegerlehner, Mark A. Yegerlehner, Massachusetts, Methodist Church, Robert Gieselman, Roscoe S. Yegerlehner, Ruth M. Myers, Shirley (Ward) Yegerlehner, West Lafayette on January 4, 2018 by Deborah Sweeney. The best time I could get out of NY on the 27th was or rather is to arrive Boston at 3:24 PM American. Will drop you a line if there is any change. The best flight back on the 3rd will be at noon from Boston. May change that, but we have time to do that. Would rather have an earlier flight if possible. 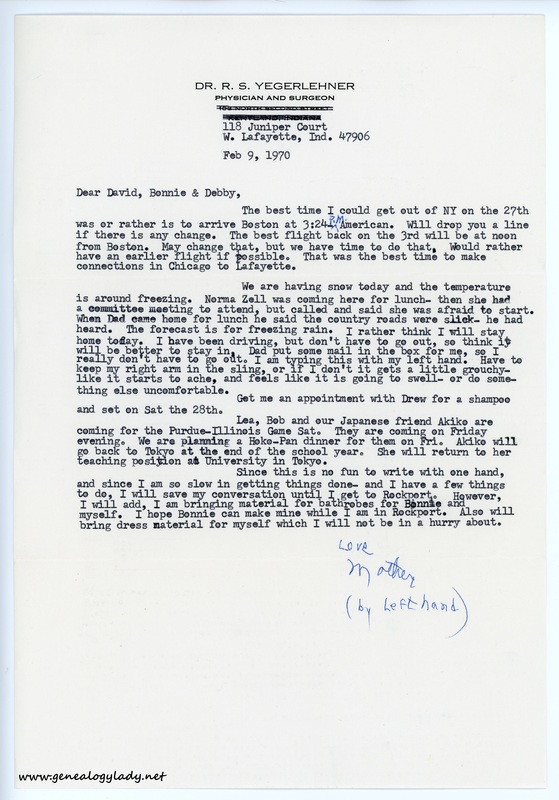 That was the best time to make connections in Chicago to Lafayette. We are having snow today and the temperature is around freezing. Norma Zell was coming here for lunch – then she had a committee meeting to attend, but called and said she was afraid to start. When Dad came home for lunch he said the country roads were slick – he had heard. The forecast is for freezing rain. I rather think I will stay home today. I have been driving, but don’t have to go out, so think it will be better to stay in. Dad put some mail in the box for me, so I really don’t have to go out. I am typing this with my left hand. Have to keep my right arm in the sling, or if I don’t it gets a little grouchy – like it starts to ache, and feels like it is going to swell – or do something else uncomfortable. Get me an appointment with Drew for a shampoo and set on Sat. the 18th. Lea, Bob and our Japanese friend Akiko are coming for the Purdue-Illinois game Sat. They are coming on Friday evening. We are planning a Hoke-Pan dinner for them on Fri. Akiko will go back to Tokyo at the end of the school year. She will return to her teaching position at University in Tokyo. 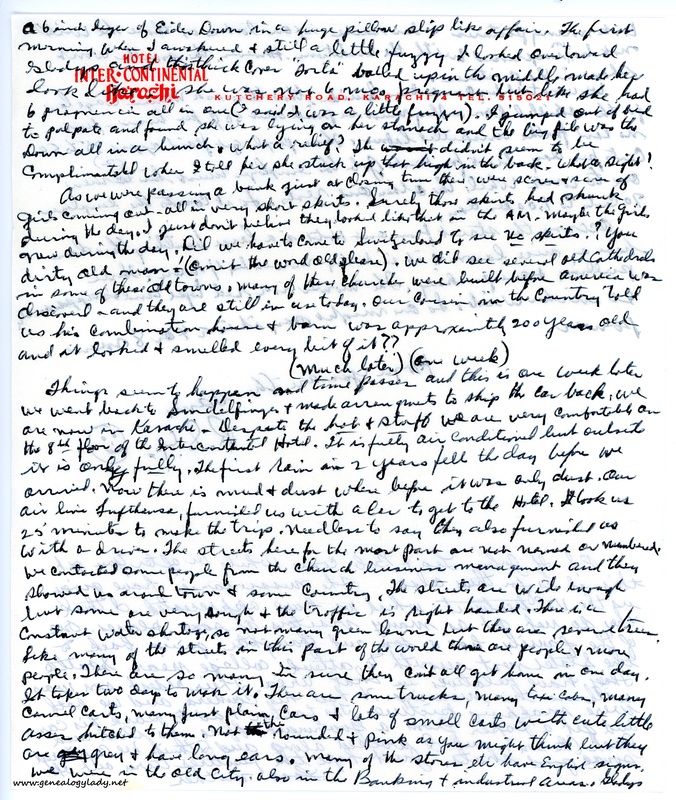 Since this is no fun to write with one hand, and since I am so slow in getting things done – and I have a few things to do, I will save my conversation until I get to Rockport. However, I will add, I am bringing material for bathrobes for Bonnie and myself. I hope Bonnie can make mine while I am in Rockport. Also will bring dress material for myself which I will not be in a hurry about. 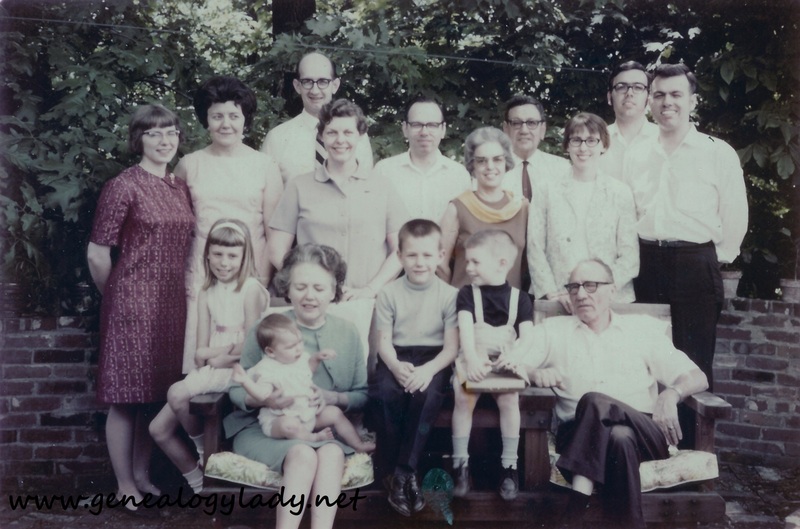 This entry was posted in Genealogy, Yegerlehner and tagged 1970, David A. Yegerlehner, genealogy, Gladys R. (Foster) Yegerlehner, Indiana, Lafayette, Lena "Lea" (Keith) Gieselman, Massachusetts, Norma Zell, Robert Gieselman, Rockport, Roscoe S. Yegerlehner on July 30, 2017 by Deborah Sweeney. We went to Champaign for a long weekend. Dad was MD for freshman team at Champaign and Purdue’s freshman team really lost, but the big team won by a large score. We had tickets for the Saturday game. We picked up our little Japanese friend – (the one we sat by on the plane coming from Tokyo to LA, in August – she is on the staff at U of I for a year – then she will go back to Tokyo – she is studying and working at U of I) on Friday evening and took her out to Lea and Bob’s place for dinner. The family all had gifts for me and a cake which was a little early, but I unwrapped gifts and when we explained that it was my birthday, she gave me a gift she had brought along – which we couldn’t decide whether she had originally meant for me or for Lea – but at any rate it was a very beautiful Christmas tree ornament – a ball wound with several different colors and very beautiful designs made by the different colors and the way the threads were interlaced. Tomorrow after Dad gets off at the S. H. C. we are going to Kentland to get the key to the office. Dr. Imperial had moved to his new office building. We have offered the building for sale to the people who live across the street, the Johnsons and also to Sid Lee who owns the apartment house on the corner next to the office. Just hope one of them decided to buy the place, because we don’t want to be bothered with it. It would cost too much to make it into a dwelling, or two apartments and it would require too much attention from 42 miles. We plan to go to Mark’s next Sunday. We had wanted to go there Oct. 19th for Kirk’s birthday, but had something going on at church – after an extensive campaign – we raised $170,000.00 for 1970 budget. They were shooting for $140, but were very happy about the $107, and when you consider the last time pledges were made a year and a half ago, only 86 thousand was pledged. I think the $107 should look good. 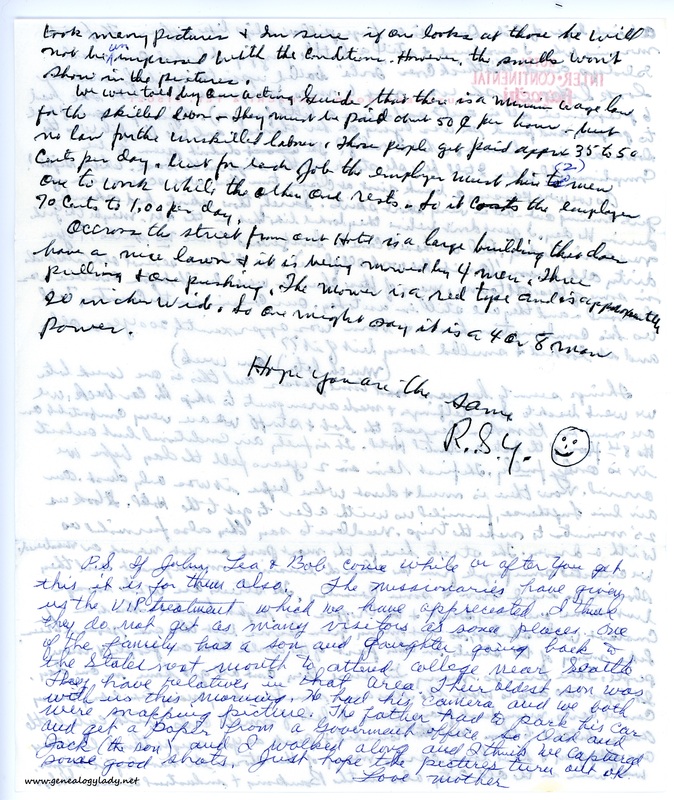 I know the Bylers are in New York – as the missionaries we met in Karachi said, he was kicked upstairs. Just wish he could help me get some money for a little girl in Penang Louise introduced to us. She is trying to get a scholarship to study in Jackson, Tenn., at Lambuth College for 4 years. I did some inquiring when we came back and was directed to Miss Margaret Swift in the Crusade Division, but so far we haven’t gotten very far. If you can be of any help tell me what to do. 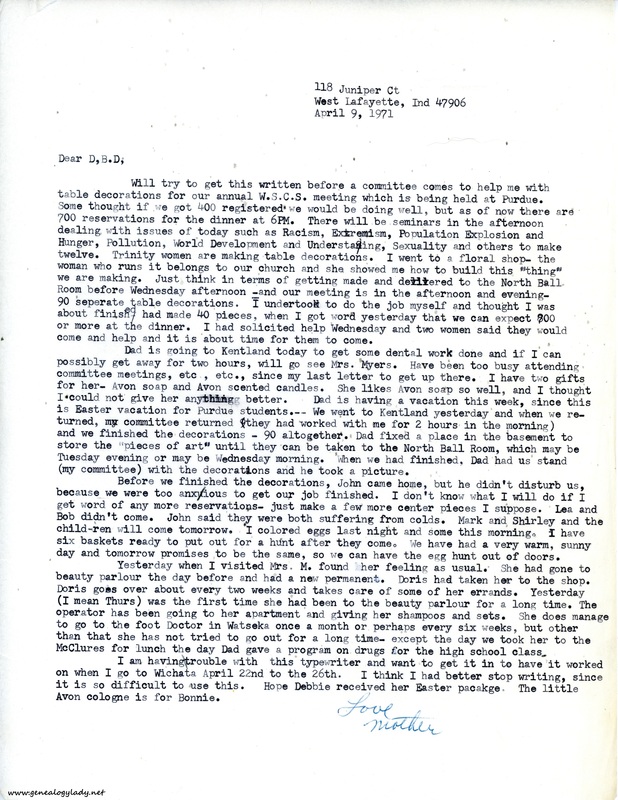 [page 2] I typed a letter for Dad and made so many errors, you would think he had done the typing himself. 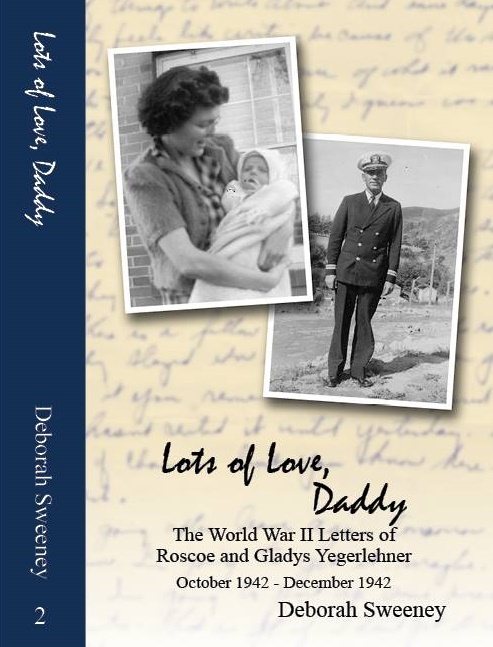 I have a two day meeting to attend at Geneva Center, Rochester, Indiana, Wed. and Thurs. The Division of Christian Outreach – and I am Chairman of Section on Social Witness. Dad gave me a new tape recorder for my birthday – it is also a radio on which one can record while listening – say to an opera or anything interesting you would want to record. It is a Longines. Pills for 5 months sent yesterday. You should have them by the time you get this. I sent them first class. 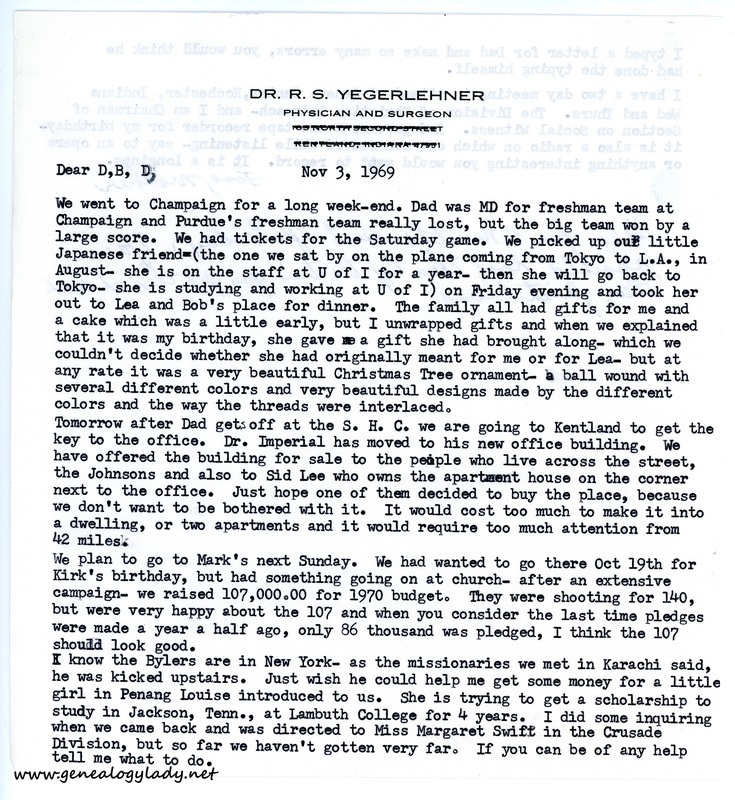 This entry was posted in Genealogy, Yegerlehner and tagged 1960s, David A. Yegerlehner, genealogy, Gladys R. (Foster) Yegerlehner, Kirk Yegerlehner, Lena "Lea" (Keith) Gieselman, Mark A. Yegerlehner, Methodist Church, Purdue University, Robert Gieselman, Roscoe S. Yegerlehner, Trinity Methodist Church on July 9, 2017 by Deborah Sweeney. I started making notes and stuff on the 17th of July so if the dates seem a little off please excuse. We have our car and have just a few more than 300 miles or should I say 500 km. It runs well, the horn blows either in German or English depending on who it is pointed toward – more universal sounds. It smells like a new car (universal smells). We met and visited with a Cousin Fritz Pyser, whose mother was a Yegerlehner. We will see her and possibly others of the clan on Sun. On Mon. & Tue. we will head back to Stuttgart to send the car to West L. We spent some time in Baden Baden – stayed one night there before going to Basal. Stayed in Basal 2 nights and now are in Muri, a small town near Bern. Right now we are watching a German TV “What’s My Line.” Seeing it is OK but it isn’t the same as hearing also (needs more universal something). Somehow I got on a universal kick. Just a passing fancy. We were walking along the street with Cousin Fritz and we stopped at a store window. He was pointing at something in the window and I saw a little pile of where a dog had been. I guided Gladys around and he came so near cutting his foot (not really cutting) that I got a bunion just twisting my foot sideways and backwards in my shoe trying to guide his foot in the right direction. I never did look back so have no way of knowing the final results. I could write a story and make the title “The Case of the Scrambled Pile or Did He?” Another pretty universal sight was one Gladys & I saw on a street in Basal. A character who had had too much, was walking in front of us. He zigged & zagged. We were not sure of getting around him without an affair – but Gladys came to the rescue and pretended like there was something in the window she wanted to buy – in the window a shot gun & a pair of boots – anyway the trick worked. We didn’t see him again. [page 2] a 6 inch layer of eider down in a huge pillow slip like affair. The first morning when I awakened & still a little fuzzy I looked over toward Gladys and this think cover “sorta” balled up in the middle made her look like she was not 6 mo. pregnant but like she had 6 pregnancies all in one (I said I was a little fuzzy). I jumped out of bed to palpate and found she was lying on her stomach and the big pile was the down all in a bunch. What a relief? She didn’t seem to be complimented when I told her she stuck up that high in the back. What a sight! As we were passing a bank just at closing time there were scores & scores of girls coming out – all in very short skirts. Surely those skirts had shrunk during the day. I just don’t believe they looked like that in the a.m. – maybe the girls grew during the day. Did we have to come to Switzerland to see no skirts? You dirty old man! (Omit the work old please). We did see several old Cathedrals in some of these old towns. Many of these churches were built before America was discovered and they are still in use today. Our cousin in the country told us his combination house & barn was approximately 200 years old and it looked & smelled every bit of it?? [page 3] took many pictures & I’m sure if one looks at those he will not be unimpressed with the conditions. However, the smells won’t show in the picture. We were told by our acting guide that there is a minimum wage low for the skilled labor. They must be paid about 50₵ per hour – but no law for the unskilled laborer. Those people get paid approx. 35 to 50 centers per day., but for each job the employer must hire two men, one to work while the other one rests – so it costs the employer 70 cents to $1.00 per day. Across the street from our hotel is a large building that does have a nice lawn & it is being mowed by 4 men. Three pulling & one pushing. The mower is a reel type and is approximately 20 inches wide. So one might say it is a 4 or 8 man power. P.S. If John, Lea & Bob come while or after you get this it is for them also. The missionaries have given us the V.I.P. treatment which we have appreciated. I think they do not get as many visitors as some places. One of the family has a son and daughter going back to the States next month to attend college near Seattle. They have relatives in that area. Their oldest son was with us this morning. He had his camera and we both were snapping picture. The father had to park his car and get a paper from a government office so Dad and Jack (the son) and I walked along and I think we captured some good shots. Just hope the pictures turn out ok. 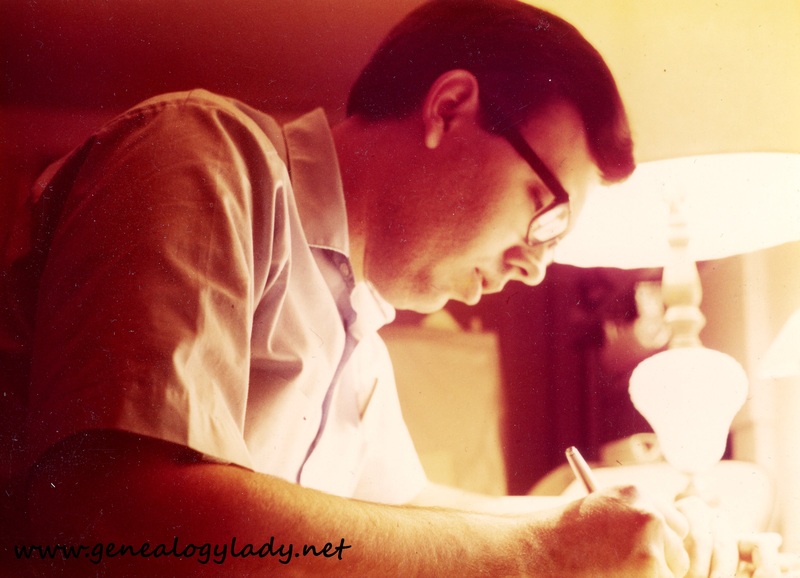 This entry was posted in Genealogy, Yegerlehner and tagged 1960s, genealogy, Gladys R. (Foster) Yegerlehner, John F. Yegerlehner, Karachi, Lena "Lea" (Keith) Gieselman, Robert Gieselman, Roscoe S. Yegerlehner, Switzerland on June 19, 2017 by Deborah Sweeney. Just hope those pictures get here before we leave, your letter came yesterday. Dad got the schedule rearranged for this week, so we are going to be leaving on Friday instead of Saturday. I asked the travel agency about flying from Boston, but was advised against that since there has been some difficulty with planes getting into airports. They thought we had better just leave from O’Hare. Dad doesn’t have to work tomorrow, but since July 10th is the last day of the special rates for tours, all seats were taken, but we did get seating for the 11th. The lab report on Dad’s skin was OK. His face has just about recovered and his black eye is entirely gone. However, he did have some discoloration for about two weeks. We went to Champaign Thursday evening and to Indianapolis Sunday morning, since we had a long weekend. We wanted to see Mark before leaving – he has power of attorney for us and John and Lea and Bob wanted us to come over before leaving. I am beginning to feel like I am about ready to go. Have the bags just about packed and hope I have thought of everything we will need while we are away. Since it has been so cool here most of the time and I had a letter from the woman I have been corresponding with in Switzerland telling me that it has been cold and rainy there, I am taking two wool suits with me. I remember three years ago I was not quite warm enough while we were there, so this time I am going prepared. This morning it was rather cool here, but by noon I had the air conditioner upstairs on and now we have both on. It is so humid and since we are on daylight (Eastern – that is) savings time, it stays light here until about 9:30. It is eight o’clock now and the sun still has some distance to go before setting. I am enclosing a copy of our itinerary for your information. We will write to you from time to time, or send you cards. I found the cards after you left that were misplaced on my desk. I had put everything on the basket behind the adding machine and the cards being slick, had slipped off and were behind the filing cabinet. Sandy Corbin was married last Saturday, but we didn’t go to the weeding since we were in Champaign. Her picture is in the Journal-Courier tonight. She was quite a beautiful bride. From the account in the paper, it was quite a large affair. Had an invitation to attend a shower for the bride to be of Jim Johnson, Nancy Dickman. They are to be married the weekend after we return and the wedding will be in Michigan, so I rather think we will not be going. We plan to return August 18th, so we can talk to you before you leave about money. When you will need it and how much. Will you keep your checking account in Rockport, or how will you handle your money? If you won’t need it until after the first of the year, how will we handle that? The enclosed letter was opened by Dad by mistake. I am sending it on, though I hardly think it would be necessary. It has been on my desk for some time. Forgot to send it the last time I wrote. 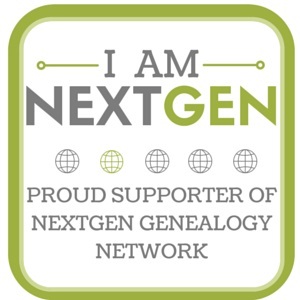 This entry was posted in Genealogy, Yegerlehner and tagged 1960s, David A. Yegerlehner, Deborah Yegerlehner, genealogy, Gladys R. (Foster) Yegerlehner, Indiana, Jimmy Ed Johnson, John F. Yegerlehner, Lafayette, Lena "Lea" (Keith) Gieselman, Mark A. Yegerlehner, Massachusetts, Robert Gieselman, Rockport, Roscoe S. Yegerlehner on June 15, 2017 by Deborah Sweeney. Up at 7:30. Had breakfast—loaded the car—heavy rain falling when we got up—kindly let up when we were loading the car. We finally got off at about 9:20. We drove through quite a bit of rain stopped several times for picture taking—including a shot of the site of the old Erie Canal locks. We ate lunch at a pleasant park along the road. We got to Buffalo about 4:30. Came directly to the camping ground: Miller’s Creek. Only 2 or 3 other campers in the area. We ate supper in the car, then about 7:00 head up on the road to see the Falls—several miles away the mist from the Horseshoe Falls was visible. We strolled around, drove around, took pictures—we found the Falls very spectacular—Debby seemed astounded by the Falls. Our drive ended about 9:00 back at the Falls; we took pictures of the illuminated falls; back at the campsite about 10:00—prepared for bed; this is written by auto headlight lights out at 10:40. Up at 6:15! Unfortunately a chilly morning. After breakfast we broke camp and got everything in the car, loaded, packed by about 8:30. Then got on the road back to Niagara. Mist was blowing from the horseshoe falls across the road—impossible to get good pictures. But we found a lot to photograph. Saw the replicas of the crown jewels. Strolled around the gardens. We had lunch on the grass in the sun near Niagara glen, headed toward Detroit—stopped to see the locks at St. Catherine. Unfortunately took slow rt. 8 through Hamilton to get to 401. Got there about 4:00—then straight through to Detroit—arrived about 7:45 our time (6:45 theirs), at the Kings ; had supper; visited; Mattijane’s brother + wife are here with 2 kids—a real madhouse altogether. Later in the evening showed how our slides; 11 o’clock saw moon TV pictures; bathed off to bed, lights out 1:12. Up about 9:00. Had a big breakfast—all the household had breakfast together—quite a gathering. Spent the morning getting the car loaded—and shaved. We finally got on the road to Gary about 11:30—somewhat later then we had hoped. A cold, overcast day. But we were able to make a good speed—with the help of huge trucks which drew us along. We arrived in Gary at Paul + Marty’s shortly after 5:00. We unloaded the car, then had supper. After supper watched CBS news—Apollo 10 orbiting the moon. After this we all got in Paul + Marty’s car and drove to the ditch where their boat is docked. We spent about an hour or so on the water—but didn’t go on to Lake Michigan—too rough. Came home, had a snack, then set up the projector—we showed them our slides. They are going through a “boat” stage— + were very interested in some of the slides; off to bed, lights out 11:45. Forget what time we got up. The morning was not rushed—rather leisurely—sat around and talked; Paul + Marty didn’t go to school—both of them weren’t feeling very well. The morning seemed to go fast; we got the car loaded and then got on the road about noon. Arrived in Kentland at Mrs. Myers’ apartment about 1:30—an hour earlier Kentland time. We stayed until after 5:00—Mrs. Krull, Mrs. Johnson, and Mrs. Hufty came by to see Debby. We got on the road again and arrived at the folks in W. Lafayette about 5:40. Unloaded the car after hurriedly looking at the box of slides which had arrived. Had supper; in the evening we just relaxed—watched a comic movie on TV. I got several pictures of the raccoons as they came begging + were fed—Al + Gwydelyn. Ran the slides through the projector; off to bed; lights out 12:07. Up at about 9:40—it was good to sleep so late. One of the first things to be done was a trip to the grocery store for baby food; then I went down into the ravine behind the folks’ home to take pictures. A very sunny, warm day. It was a day of just relaxation; Bob + Lea + John arrived for lunch. In the afternoon I made a trip for film + postcards—wrote postcards to people in Rockport—had an opportunity for chatting with Bob and John. For supper we ate out on the patio—a delightful meal. Debby was in her playpen; Lea was pretty occupied with Debby; Lea had her third miscarriage last week. After supper we watched TV—some inane programs, but then The Miracle Worker came on—the story of Annie Sullivan and Helen Keller. During the movie we saw a telecast from Apollo 10 at hundred at 169,000 miles from Earth; after movie we showed our slides; bathed; off to bed; lights out 12:54. Up about 7:30. Shaved; dressed; mother, father, John, Bonnie + I went to the 9 o’clock service at the Trinity Methodist. Home around 10:00. 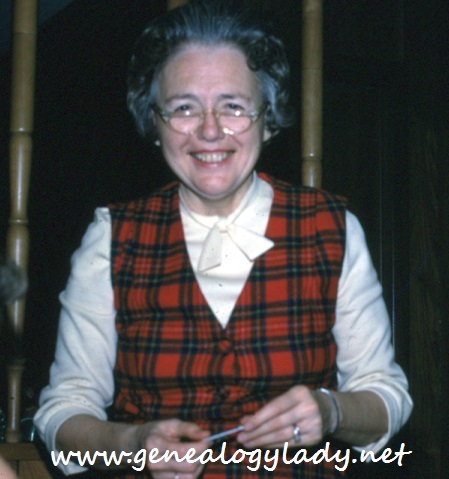 Relatives began arriving: Floyd + Ruth came after Bob, Lea, John; Mark + Family; Alma Hubbel. We had lunch on the patio—a nice day. Uncle Clarence + family were here for a short time. Posed for pictures—I was the photographer. We spent the afternoon lounging around, talking, relaxing. Bob, Lea + John were still here for supper; after supper I climbed down into the ravine with Dad. Watched TV—utterly slummed. During the evening we called Joyce Fitz-Randolph in New Jersey to arrange to stay with her on Friday night. This has been a very relaxing day—we managed to avoid feuding over politics. But also rather tiring; off to bathe about 11 o’clock. θ+ lights out before midnight. Rev & Mrs. Levon King (wife Mattijane); he was one of the ministers who married us; the other, Harold Hill. 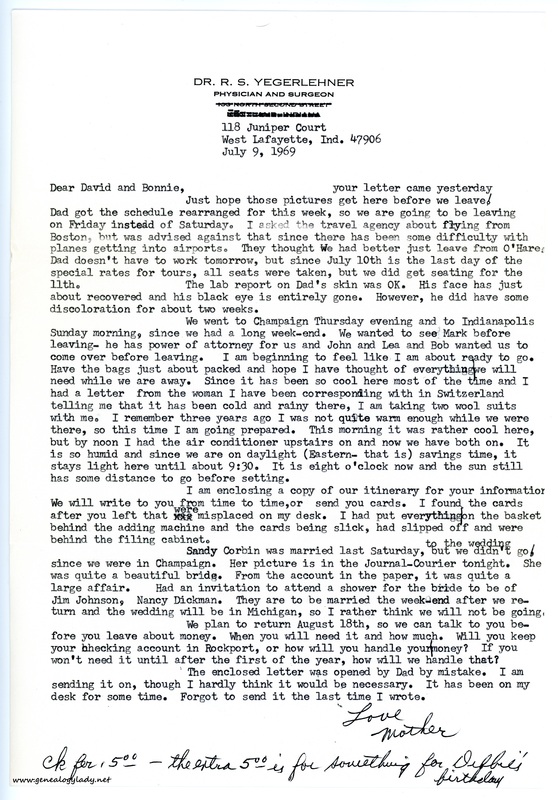 This entry was posted in Genealogy, Yegerlehner and tagged 1960s, David A. Yegerlehner, David W. Yegerlehner, Deborah Yegerlehner, genealogy, Gladys R. (Foster) Yegerlehner, Indiana, John F. Yegerlehner, Kirk Yegerlehner, Lafayette, Lena "Lea" (Keith) Gieselman, Mark A. Yegerlehner, Rebecca C. Yegerlehner, Robert Gieselman, Roscoe S. Yegerlehner, Shirley (Ward) Yegerlehner on June 6, 2017 by Deborah Sweeney.